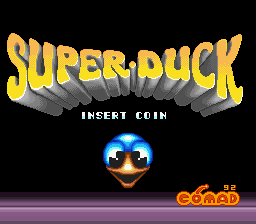 It’s no great secret that the majority of Comad’s games are just hacks of something else, and when system11 picked up a Comad ‘Super Duck’ board on eBay, with no ingame screenshots, my initial feeling was that this would be no difference. 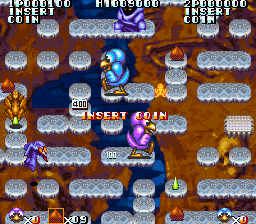 When the board arrived and was dumped by system11 I was in for a surprise however, this was actually one of the few original Comad titles, up there with Pushman and Bouncing Balls. 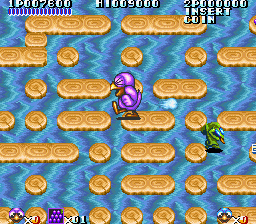 The hardware was clearly derived from a similar base as those two titles, but had some significant differences, the main one being that instead of 1 large ROM based tilemap (fixed layout) it had 2 RAM based background tiles. 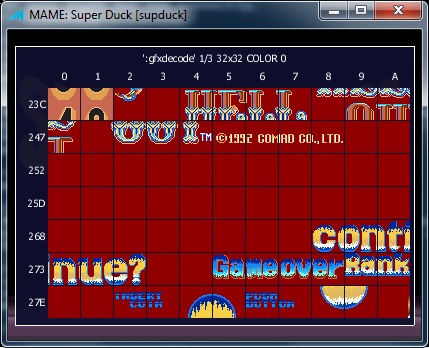 Working out the format of those tilemaps (the page layout, tile size etc.) took a little while, and again proved to be somewhat related to the original ROM based tilemap in that the tiles were 32×32 pixels, and the whole thing was arranged as pages, but the subtle differences took some ironing out. 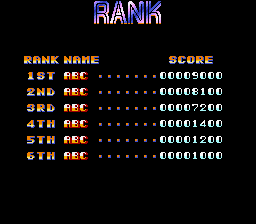 The palette also took some work, it uses an unusual format xRGBRRRRGGGGBBBB format where the group of 3 bits at the top are the most significant bits of the palette data, the xRGBRRRRGGGGBBBB format in MAME uses them as the least significant. Sound etc. 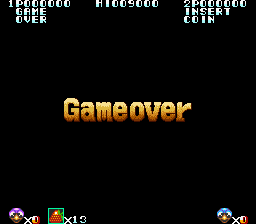 was easy enough, basically the same as Zero Zone etc. but with added sample banking. It’s a fairly simple maze game where you need to collect a set number of items from the maze to progress. 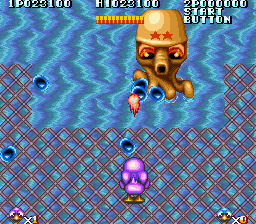 Every few levels there is a boss level, the first one being an octopus. You can collect power-ups which allow your character to release some gas to stun the enemies. Various other bonus items exist. 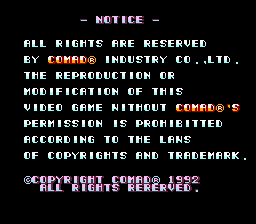 Another interesting point is that this appears to be one of the few Comad games with no adult content, assuming it doesn’t come later at least. Another previously unknown game saved for the ages..
*edit* It was pointed out on Mameworld that the game looks a lot like ‘Hell Out’ for which we have a Comad flyer. The tile roms do indeed contain a logo for ‘Hell Out’ but there is no way to make the set we have use that as a title, I thought it might be a message for when you complete the game, but based on the flyer evidence it’s probably a clone of this. then it’s likely they kept the title ‘Hell Out’ for western markets.. It looks like Comad decided to change the theme of Hell Out to something more kiddy, but only got halfway through before it was released… but that’s just my guess. 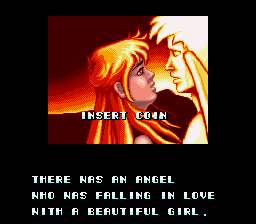 The excuse plot sounds like some sort of a Biblical romance or something, and it looks completely out of place with the actual game graphics. And since this is Comad we are talking about, do they sneak… ugh… cough… “fanservice” in the game? So God turned the angel into a duck? Hell Out I guess is without a doubt the original then, considering they didn’t change the intro cutscene at all to fit the duck theme. 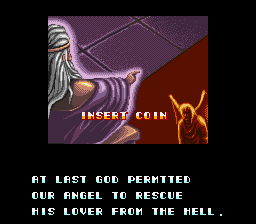 > So God turned the angel into a duck? 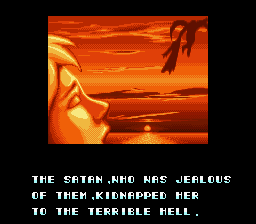 > Hell Out I guess is without a doubt the original then, considering they didn’t change the intro cutscene at all to fit the duck theme.